To some people, a seven-seater like the Toyota Verso is the sole preserve of large families and minicab firms. It’s obvious why the Verso’s combination of versatility, practicality, durability and reliability would appeal to these buyers, but why should they be the only ones to reap the benefits of the Verso’s clever design and feature-filled specifications? For that reason, we teamed up with several seven-player sports teams to put the Verso to the test in a different setting, demonstrating how well its many different features serve those with a busy and active lifestyle and deliver everything you expect of a Toyota passenger car with added flexibility thrown in for good measure. First up for the Verso was a weekend with a seven-member team from UK Ultimate. What could they throw at the Verso that others hadn’t in the past? Quite literally, frisbees, for UK Ultimate oversees the sport of ultimate frisbee. For those of you that haven’t heard of it before, ultimate frisbee takes everyone’s favourite flying disc out of the local park on a Sunday afternoon and tosses it into an environment where two teams of seven players compete for ultimate honours. Seven players means that transport to and from events usually takes a minimum of two vehicles, but with a Verso that requirement was instantly cut in half. UK Ultimate’s Coaching & Development Manager and 2012 World Championship silver medalist Liam Kelly was custodian of the Verso for the weekend, using it to ferry him and his ‘Catch Those’ teammates from the Wirral to the event organised by Merseyside Ultimate. In the same way that Toyota has made the Verso easy to adapt to and simple to just jump in and drive, ultimate frisbee is similarly appealing to people of all ages and walks of life. Getting started requires no special skills other than the ability to pick up a flying disc and throw it – it’s the kind of thing you can begin with friends in the park and take further as your abilities grow. At competition level, the men and women of UK Ultimate are fit and highly-skilled, which is needed in the fast-paced game. Similar to rugby or American football, ultimate frisbee is played on a field or court with two goal-scoring endzones, but it is a non-contact sport and breaks with regular sporting convention by not having a match referee to enforce rules. Instead, the two teams are responsible for foul and line calls, reinforcing the positive spirit of sportsmanship and fair play and contributing the enjoyment of the game. 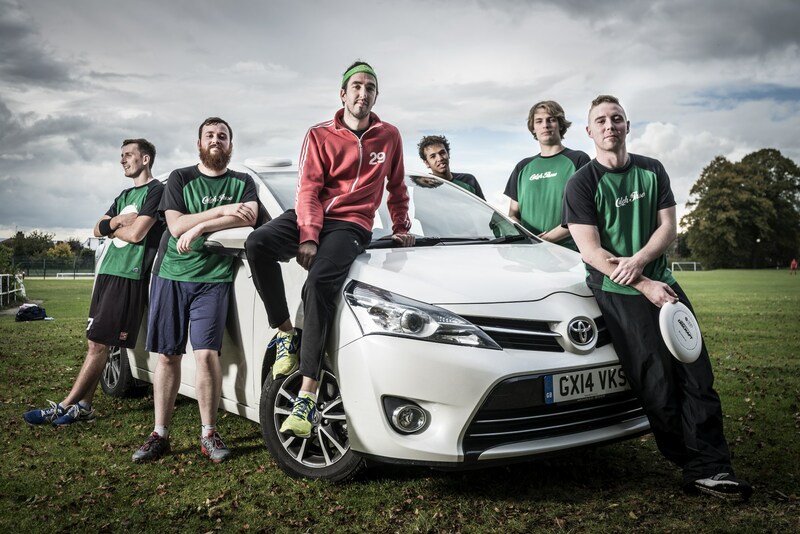 Fresh from its encounter with the frisbee experts of UK Ultimate, our Verso will be back in action in a few weeks’ time as we join another team of seven players for the weekend to see how the Toyota fulfills its brief as a multi-purpose vehicle. In the meantime, with prices* starting from £18,300 for the petrol-engined Verso 7-seat MPV, it’s easy for you to get involved – simply head to your local dealer to experience the Verso for yourself, or leave a comment below and we’ll happily arrange a test drive for you. And if you’d like to try your hand at ultimate frisbee, UK Ultimate maintains a directory of clubs around the country – head to www.ukultimate.com for more information or connect with the organisation on Facebook or Twitter.